Johnny Finder 2 and the Crystal Skull is another point and click adventure game created by abroy. This basically the sequel to JF part 1 which is equally fun as this one. Johnny is back to face yet another exciting adventure - the quest to retrieve a sacred artifact, a mysterious crystal skull. 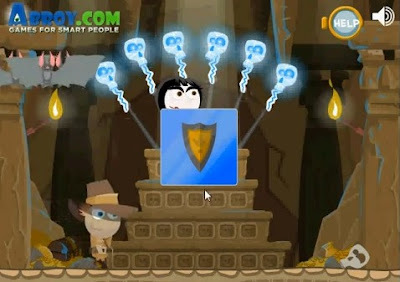 The game features cute nice graphics and good animation with challenging puzzles and scenarios to solve. There are items in each levels which are essential to solving that level your are on. Just analyze each level carefully and think outside the box. Anyways, if you need some help, hints and tips you can see the solution to beat this game in the JF2 Johnny Finder 2 walkthrough we have here.